Living Church Ministries welcomes you to this website! Sharing the Good News all around the world. Jesus came to lead us to Salvation. 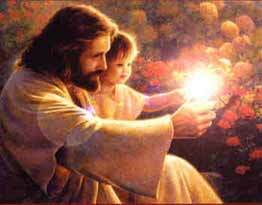 He shows us the The Way, the Truth and the Light of Love. Let us join Together Now in Christ and in Joy! Jesus is the Holy Son of God. He came to earth to be a Witness for his Father's Love and to teach Forgiveness. The name Jesus brings associations such as Peace, Miracles, Love and Healing. His teachings were full of parables and stories which helped those with the ears to hear to understand what he wanted to say about God and about the nature of our Salvation. God has many helpers, but Jesus is for you the bearer of Christ's single message of the Love of God. You need no other. It is possible to read his words and benefit from them without accepting him into your life. Yet he would help you but a little more if you will share your pains and joys with him, and leave them both to find the peace of God. Yet still it is his lesson most of all that he would have you learn, and it is this: There is no death because the Son of God is like his Father. Nothing you can do can change Eternal Love. Forget your dreams of sin and guilt, and come with Him instead to share the resurrection of God's Son. And bring with you all those whom He has sent to you to care for as Jesus cares for you. The name of Jesus is the name of one who was a man but saw the face of Christ in all his brothers and remembered God. So he became identified with Christ, a man no longer, but at one with God. Jesus remains a Savior because he saw the false without accepting it as true. And Christ needed his form that He might appear to men and save them from their fears. Follow Him as He asks you to and you will see within yourself, the Way the Truth and the Light that Jesus showed himself to be. "You will do greater things than these."